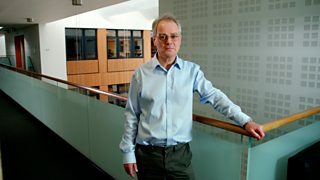 BBC Two - Trust Me, I'm a Doctor, Series 3, Episode 3 - How can I avoid getting cancer? In order to find out the health questions you really wanted an answer to, we commissioned a poll of 2,000 people. The results showed that almost 40% of those surveyed were keen to know ‘How can I avoid cancer?’ (According to ComRes poll conducted online 22-23rd April 2015 with 2,051 GB respondents 18+). Cancer is a disease in which one cell in the body accumulates enough genetic damage to trigger it to start to divide out of control. The number of cells at that site grows into a tumour, and these cancerous cells can then start to spread around the body. That can, eventually, lead to illness and death, and cancer of one form or another is the leading cause of death in the UK. There are up to 200 different types of cancer, but some are much more common than others, and they can be triggered by different things. In men, the most common in the UK are prostate cancer, followed by lung cancer and bowel cancer. In order to discover what these risk factors are, Michael Mosley visited Oxford University’s Cancer Epidemiology Unit. He spoke to Professor Tim Key, a Cancer Research UK scientist currently working on one of the largest cohort studies in the world (EPIC) to explore the relationship between diet, lifestyle and cancer. People who smoke a lot for a long time will be around 50 times more likely to get lung cancer than those who’ve never smoked. And it’s never too late to give up. People who stop in their 30s can eliminate most of the increased risk, but even by your 50s and 60s there’s still a huge benefit in quitting. Smoking also increases the risk of cancers of the mouth, throat and oesophagus 10-15 times. Alcohol also affects the risk of cancers of the mouth, throat and oesophagus, not quite as much as smoking, but if you both smoke AND drink heavily then your risk of these cancers increases around 50 times. Alcohol is also implicated in other forms of cancer – about 4% of cancers in this country are thought to be caused by alcohol. Liver cancer is one (triggered by cirrhosis), but another is breast cancer. Because there is so much data on breast cancer, the link is fairly certain and for women who drink a largish glass of wine a day, the increase in risk is about 10%. For those who have two or three glasses a day, that increase in risk goes up to 20 or 30%. Obesity causes about 5-6% of cancers in the UK. One particularly well-understood risk is obesity in women after the menopause, which increases the risk of breast cancer by about 50%, because fat cells produce oestrogen which increases the chances of breast cancer occurring. So staying slim after the menopause is particularly important. It’s difficult to pin down the exact effects of different aspects of our diets on our health. There are two kinds of evidence – one is an association. So, for example, men with higher levels of the chemical lycopene are less often diagnosed with advanced prostate cancer. Lycopene is found in tomatoes (and particularly in tomato paste) and does travel into the blood when we eat them. But no one yet knows whether eating more tomato paste will decrease your risk of getting an aggressive prostate cancer. The other kind of evidence is where there are two groups of people who are very similar in every aspect of their lifestyle and diet apart from one thing. For example, in Oxford, Professor Key’s group have been following a group of 65,000 people of whom half are vegetarians. They have looked at whether there is evidence that eating red meat increases the risk of colorectal cancer, and at the moment they have found no evidence that it does. The general advice though is still to eat not more than around 70g a day on average – which is about the average intake in the UK. It seems likely that eating more fibre decreases the risk of bowel or colorectal cancer, but there’s little evidence on anything else in the diet being of benefit. Some people have also looked at taking supplements such as the antioxidant vitamin E, beta carotene, and selenium for prevention of lung cancer and prostate cancer. No trials showed a benefit, and some showed adverse effects, so the advice now is not to try taking supplements (except in order to reach normal recommended levels, such as for vegans who should take vitamin B12 supplements as they may not get enough through their diet). The other things that are important to do to reduce your risk of cancer are to avoid sunburn, to reduce your risk of skin cancer, and to get vaccinated against HPV, the human papilloma virus, which causes cervical and other cancers.